Rationalism : વીવેકપંથ : Group of Rationalist: સટોડીયાઓ પાસે કેટલા બધા મોદીઓ. દરીયા વચ્ચે હોળીમાં હાલક દોલક થતા. અસલી ચહેરા માટે હજી ૨-૪ દીવસ રાહ જુઓ. સટોડીયાઓ પાસે કેટલા બધા મોદીઓ. દરીયા વચ્ચે હોળીમાં હાલક દોલક થતા. અસલી ચહેરા માટે હજી ૨-૪ દીવસ રાહ જુઓ. કમાલ છે. ફોટામાં બે જણાંએ ઉલંગ્ઘન કરી અસલી ચહેરો બતાવી દીધેલ છે. એકનો મોહરો તો દેખાય છે. Can Shri Modi be trusted with India’s security? વીવેકપંથ પર વિવેકી લોકોનો જ જાય થાય છે,માટે ચિંતાનું કોઈ કારણ નથી! મોદીએ જાત બદલી? જાત દેખાડી? દામજીભાઈ, ગૌતમભાઈ, સંતોષભાઈ, કાંતીલાલભાઈ બધાને ફોન લગાડેલ છે. ૨૭૦નો ભાવ બંધ છે. મોતીલાલભાઈનું કહેવું છે ગેનની ગોળી ખાઈ પંખા નીચે સુઈ જાઓ. ૨-૪ દીવસ આરામ કરો. નેહલબેન પુછે છે આ બધું શું છે. MUMBAI: Macquarie says markets are pricing in the Bharatiya Janata Party winning 230 seats in the ongoing elections, calling that its "base case" as well. Macquarie estimates a number around that range could spark gains of 5-10 percent over one month in Indian shares, while a number above 240 seats would spark 15-20 percent gains. By contrast, should BJP and allies clinch less than 200 seats, Macquarie says markets could fall 15-20 percent over the next month. BJP and its allies would need 273 seats to clinch a majority, although analysts say a number near it would comfort markets and raise the prospect of a more stable coalition. CHANDIGARH: While BJP's PM candidate Narendra Modi asserts that the saffronBSE 4.84 % party will form the "strongest government since Rajiv Gandhi's government", bookies aren't confident of it wining a clear majority. While Narendra Modi remains the favourite for the post of prime minister, they do not think the BJP would get over 272 seats, which would give it a clear majority in the Lok Sabha and an opportunity to form a government without much interference from allies. The last ..
On the morrow of May 16 all eyes will be on Rashtrapati Bhavan. As a stickler for constitutional propriety, President Pranab Mukherjee will invite the leader of the largest political party or coalition to form the government and prove - within a reasonable period of time - that it enjoys majority support in the Lok Sabha. No one seriously doubts that the leader will be Narendra Modi. Should he realise the goal he set for himself when he embarked on the election campaign - 272+ - the new government will be in place without a major hiccup. Its composition would obviously bear Modi's cachet. Allocation of portfolios is bound to cause heartburn in some quarters. But Modi won't be distracted by what, in his eyes, are trifles. For more than a decade he has steamrolled anyone who dared to cross his path. Chandni Chowk Lok sabha Seat Result Winner 2014 eciresults.nic.in information and details has been provided here. Chandni Chowk is another urban parliament constituency in NCT Delhi. It is the most important lok sabha seat and there was triangular fight among candidates from parties Congress, BJP and AAP. आम चुनाव के बाद नई सरकार बनाने के लिए आम आदमी पार्टी के संयोजक अरविंद केजरीवाल ने किसी भी दल को समर्थन देने की बात से इनकार कर दिया है. केजरीवाल ने सोमवार को ट्वीट कर ऐसी ख़बरों का खंडन किया. उन्होंने कहा, "हम किसी भी दल को समर्थन नहीं देंगे." केजरीवाल ने कहा कि चुनाव के एक दिन पहले ऐसी बातें करके जनता को गुमराह करने की साजिश न करें. इससे पहले आम आदमी पार्टी के नेता गोपाल राय ने कहा था कि उनकी पार्टी भाजपा को सत्ता में आने से रोकने के लिए तीसरे मोर्चे को समर्थन देने के लिए सोच सकती है. 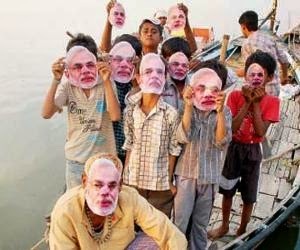 गोपाल राय ने कहा था कि यदि 16 मई को चुनाव परिणाम आने के बाद तीसरे मोर्चे की सरकार के लिए पहल होती है तो पार्टी उसे मुद्दों पर आधारित समर्थन की पेशकश करने पर विचार कर सकती है. Media has praised successive high voter turnouts as the nine-phase general elections draw to a close. The first phase was conducted on 7 April, and the last is being held on 41 seats in the states of Uttar Pradesh, Bihar and West Bengal on Monday. Vote counting is due on 16 May. "In the first eight phases, 66.2% of registered voters have exercised their right to vote. That compares with the previous best turnout of 64% during the 1984-85 parliamentary election," the Hindustan Times says. The paper adds that the overall voter turnout may touch 65%. The Indian Express points out that "voter turnouts had failed to touch even 60%" in the last three general elections. The paper adds that "larger states such as Orissa, Kerala, Tamil Nadu, Andhra Pradesh, Chhattisgarh, Karnataka, Jharkhand, Gujarat and Rajasthan" witnessed unprecedented turnouts this year. The paper, however, says that hot weather conditions may impact voter turnout on Monday. VARANASI, India — Shortly after dawn in the village square here each day, two dozen boys and men dress up in crisply laundered khaki shorts and fall into military-style formation behind a saffron-colored flag, brandishing bamboo sticks as if they were rifles. They spend the next hour performing highly structured drills that interweave physical training with religious indoctrination, ending with 108 repetitions of the chant “Ram Ram,” which refers to a Hindu deity, and a song whose refrain is, “The nation should awaken.” This is a local branch of Rashtriya Swayamsevak Sangh, an ideological organization whose fortunes have ebbed and flowed for decades with the influence of Hindu nationalists in New Delhi. With India’s national election campaign in its final stages, the R.S.S. has thrown its weight behind Narendra Modi, who has been active in the group since childhood and is now the front-runner for prime minister, India’s highest office. The group’s leaders describe the current voter-turnout drive as the biggest mobilization since 1977, when R.S.S. workers went door to door encouraging people to vote against Indira Gandhi, sometimes going so far as to wheel them to the polls on manual tricycles. OH BHARAT PUTRA's & PUTRI's, Son's & Daughters of BHARAT MATA - BELONGING TO THE HOLY LAND PUNYA KARMA VEER BHOOMI OF HINDUSTAN --- GET READY TO CELEBRATE THE FREEDOM FROM FOREIGN PROXY CONGRESS PARTY and GET READY TO CELEBRATE REAL INDEPENDENCE DAY FOR INDIA WHICH WILL BE ON MAY 16th 2014 WHEN AFTER 800 YEARS FOR THE FIRST TIME AFTER A LONG LENGHTY GAP A DESH BHAKT STAUNCH PATRIOTIC STRONG NATIONALIST Bharat Vasi INDIAN ( who will GOVERN based on NATIONAL INTEREST & will NEVER Compromise on National Securiy for petty political Gains ) IS GOING TO RULE, GOVERN & LEAD HINDUSTAN WHO IS SHRI NARENDRA BHAI DAMODARDAS MODI ( REAL SON OF BHARAT MATA BORN & RAISED IN THE SOIL OF BHARAT VARSHA WHO HAS BHARATIYA BLOOD RUNNING ON HIS VEINS ) TAKES OVER AS DESI PRIME MINISTER OF HINDUSTAN WHO WILL BE OUR ULTIMATE BELOVED SUPREME LEADER OF THE PEOPLE OF INDIA --- Let us all BID GOODBYE to 600 Years of Mull@h Miyan Rajya - Let us all BID GOODBYE to the 200 Years of Anglo American British Vatican Italian Rome Rajya - Let us all WELCOME BACK our good ol RAM RAJYA ( Unity Integrity Peace Progress Prosperity & Development for All ) ---- GOLDEN AGE - An Era Of Renaissance, Has Already Begun for Bharat & People of Hindustan ---- Congress Mukt Bharat - Ab Ki Baar Modi Sarkar - Ek Bharat Sreshta Hindustan - Jai Hind !!! (Reuters) - President Barack Obama faces the prospect this week of having to offer his congratulations to a leader who was barred from the United States less than 10 years ago over massacres of Muslims in 2002. As voting concluded in India's general election on Monday, four major exit polls showed Hindu nationalist Narendra Modi set to become prime minister, with his Bharatiya Janata Party (BJP) and its allies forecast to sweep to a parliamentary majority. A Modi victory would be a blow for campaigners who have long maintained he is an autocratic Hindu supremacist responsible for an outbreak of religious riots in his home state of Gujarat in 2002 in which more than 1,000 people, mostly Muslims, died. Modi was shunned by Western nations for years after the bloodshed in Gujarat, where he has been chief minister since 2001. He was denied a U.S. visa in 2005 under the terms of a 1998 U.S. law which bars entry to foreigners who have committed "particularly severe violations of religious freedom." Modi's rise on the national stage, however, and the importance of relations with India, which the United States sees as a key counterbalance to China in Asia, have forced a rethink. Ambassadors of the European Union and the United States have met Modi to patch up relations. Modi has denied any wrongdoing in 2002 and, in 2010, the Supreme Court ruled that he had no case to answer. The U.S. State Department has repeatedly declined to spell out whether it will issue a visa to Modi as prime minister, but analysts say it is all but certain he will be given one because of the "strategic" nature of the U.S.-India relationship, which Obama has called "one of the defining partnerships of the 21st century." On Monday the State Department described the Indian elections, which were spread over five weeks, as "an inspiring example of the power of the democratic process in action" and stressed their peaceful nature - in spite of the killing of 41 Muslims in Assam. "We view our relationship with India as one that's vitally important for economic, strategic reasons," spokeswoman Jen Psaki said. "We look forward to working with the leaders chosen by the Indian people to advance this important partnership and to set an ambitious agenda." Members of the U.S. Congress campaigned against a visa for Modi in 2005 under the International Religious Freedom Act, but the strength of the anti-Modi lobby has since dwindled. Millions of Indian voters wrapped up the country’s mammoth national election Monday, and exit polls indicated that Hindu nationalist opposition leader Narendra Modi was the front-runner for prime minister. (Rajesh Kumar Singh/ Associated Press ) - People wait in a queue to cast their votes at a polling station in Jaunpur, in the northern Indian state of Uttar Pradesh, India, Monday, May 12, 2014. Millions of Indian voters wrapped up a mammoth national election Monday, braving the searing sun on the final day of polling with the Hindu nationalist opposition candidate seen as the front-runner for prime minister. With 814 million eligible voters, India has been voting in phases over six weeks, with results expected on Friday. (Bernat Armangue/ Associated Press ) - Indians stand in a queue to cast their votes at a polling center on the last day of polling in Varanasi, in the northern Indian state of Uttar Pradesh, Monday, May 12, 2014. Millions of Indian voters wrapped up a mammoth national election Monday, braving the searing sun on the final day of polling with the Hindu nationalist opposition candidate seen as the front-runner for prime minister. With 814 million eligible voters, India has been voting in phases over six weeks, with results expected on Friday. (Bernat Armangue/ Associated Press ) - People check their names in the list before casting their votes near a polling station in Varanasi, in the northern Indian state of Uttar Pradesh, Monday, May 12, 2014. Millions of Indian voters wrapped up a mammoth national election Monday, braving the searing sun on the final day of polling with the Hindu nationalist opposition candidate seen as the front-runner for prime minister. With 814 million eligible voters, India has been voting in phases over six weeks, with results expected on Friday. (Bikas Das/ Associated Press ) - A nun of the Missionaries of Charity, the order founded by Mother Teresa, leaves after casting her vote as others wait on the final day of polling in Kolkata, India, Monday, May 12, 2014. Millions of Indian voters wrapped up a mammoth national election Monday, braving the searing sun on the final day of polling with the Hindu nationalist opposition candidate seen as the front-runner for prime minister. With 814 million eligible voters, India has been voting in phases over six weeks, with results expected on Friday. (Rajesh Kumar Singh/ Associated Press ) - People wait in a queue to cast their votes at a polling station in Jaunpur, in the northern Indian state of Uttar Pradesh, India, Monday, May 12, 2014. Millions of Indian voters wrapped up a mammoth national election Monday, braving the searing sun on the final day of polling with the Hindu nationalist opposition candidate seen as the front-runner for prime minister. With 814 million eligible voters, India has been voting in phases over six weeks, with results Pakistan worries that the U.S. pullout from Afghanistan may spark fighting and chaos on its border.